The Curtis Coffee Filter GEM-6-102 is made to work in conjunction with Wilbur Curtis brewers to extract maximum flavor from coffee grounds without any bitter compounds or sediment getting into the coffee. The Curtis Coffee Filters GEM-6-102 are designed to work with many of the same Wilbur Curtis brewers as the more standard GEM-6 paper filters, but the GEM-6-102 filters have a slightly wider base and slightly shorter sides. Where the the GEM-6 filters have a 4” base and 4.25” sides, the GEM-6-102 filters have a 5.25” base and 3.75” sides. With sides that are fluted to prevent collapsing, and with paper that has been bleached using a chlorine-free process, Curtis paper filters are designed to work with Curtis brewers to make perfect coffee. 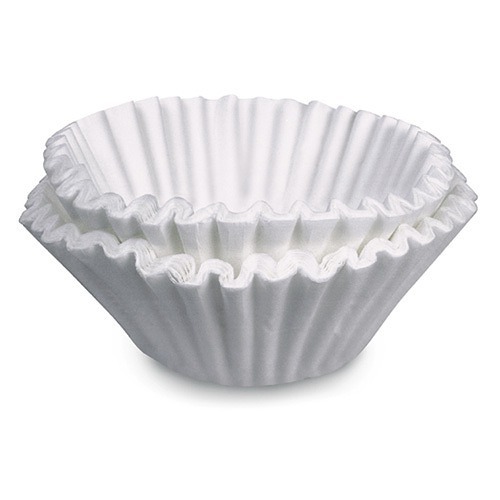 The Curtis Coffee Filters GEM-6-102 are used in brew cones used on the following Wilbur Curtis coffee brewers: GEMTS, GEMSS, GEM-12D, TP2T, TP2S, and TP1T. Be sure to check your brew cone to make sure that you are ordering the correct filters. GEM-6-102 filters are designed for the following brew cones: WC-3354, WC-37308, and WC-33001-01. If you cannot find the “WC” number, or if you still have questions, call Wilbur Curtis at 800-421-6150 to find out which paper filter is recommended for your brewer.